CNN) -- The world's fastest man Usain Bolt has withdrawn from a meeting in South Korea later this month due to fatigue, according to its organizers. The triple Olympic and world champion sprinter was due to line up in Daegu on September 25, with the one-day event to be a warm-up for when the city hosts the next World Athletics Championships in 2011. However, the Jamaican's agency has advised Korean officials that he will not take up his invite as he is too tired after a long season. 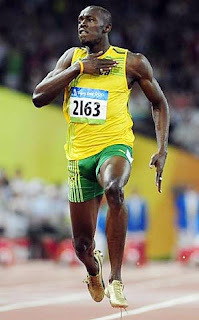 Bolt had reportedly agreed to a $500,000 fee to take part in the 100-meter race in Daegu. "Bolt's agency informed us that he can't compete here due to his tight schedule," said an official from Bolt's sponsor Puma, according to Korean news agency Yonhap. The Daegu World Athletic Championship committee also received the message from Bolt's agency. "I received an e-mail from Bolt's agent. It stated the sprinter is tired from competing in Europe over the past two months and wishes to return home for some rest," Moon Dong-hoo, the vice president of the organizing committee for the 2011 Daegu IAAF World Championships in Athletics, told Yonhap. Bolt, who broke his own world records for both the 100m and 200m in winning world titles in Berlin last month, is now expected to end his 2009 campaign at the World of Athletics Finals in Greece this weekend. The 23-year-old will reportedly run only the 200m in Thessaloniki, having complained of tiredness after winning that event at the Golden League meeting in Belgium last Friday. The Daegu showpiece will feature 200 athletes from 30 nations in 16 events, and organizers are now seeking to replace Bolt with another high-profile name. "We are trying to invite Asafa Powell of Jamaica and Tyson Gay of the United States, but Gay could be a little hard because he has a thigh injury," a committee official told Yonhap.